Julia, in everyday life is a Psychic Astrologer. Born in New York City, raised in Carmel, New York, her love of animals came from her father, Jack. Julia fell in love with Golden Retrievers 35 years ago, when she met her first two! 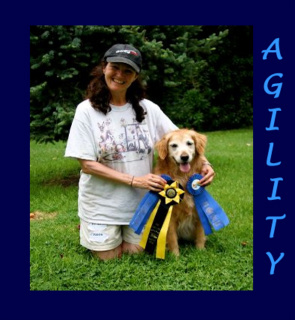 Julia and Belle discovered agility because Belle at 8 months of age, needed a job! Belle became the second California Golden to achieve the AKC Mach title, and the second Golden to enter the GRCA's ADHF(Agility Dog HAll Of Fame).